Gongura - The Magic Leaves! Gongura is a green leafy vegetable found in India. Its preparations are famous in Andra Pradesh; it is also available in North Eastern states of India. These leaves can be made into chutney, gongura chicken, gongura dhal and pickles. Gongura leaves are rich in vitamins, iron, and folic acid and anti oxidants which are essential for human body. A person with low hemoglobin level and immunity can consume gongura preparations occasionally to boost immunity and improve hemoglobin levels. A pregnant woman, along with her folic acid drugs, can also consume gongura chutney/pickles. Gongura chicken/dhal along with a serving of cereal and curd would make a balanced meal. • Wash gongura leaves and separate them from the stem. • Fry green chillies and red chillies in oil on medium flame. • Heat sesame seed oil; add asafetida, turmeric powder and gongura. Cook gongura leaves till soft and cool it. • Grind all the ingredients (except mustard seeds and fenugreek powder) into a fine paste. Heat 1 tbsp of oil in a pan; add mustard seeds, ground gongura paste and fry on medium flame for another 10 minutes. • In the end, add powdered fenugreek to the gongura mixture and mix well. • Gongura chutney is ready. This chutney goes well with rice, dosa, poori, chapatti and roti. 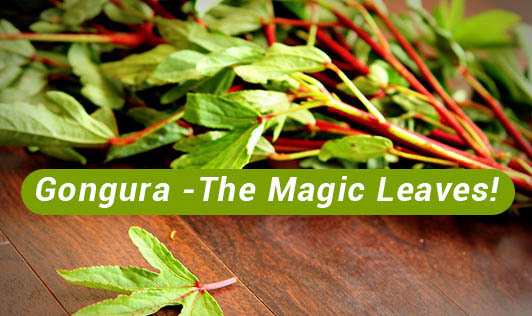 Enjoy the chutney and also gain the benefits of these magic leaves.